Have you ever wondered if there are fun, yet productive activities during the summer in Podujeve? After a successful first edition of Podujeva Academic Workshop Series (PAWS) last year, IPKO Foundation has helped me and my team to take PAWS to the next level with a new edition this year. The Podujeva Academic Workshop Series (PAWS) is an English-language course designed to help high school students in the Municipality of Podujeva gain academic and professional skills and knowledge. This year, PAWS began on the 30th of June, and the selected students have been meeting for sessions every Saturday since. PAWS students have been familiarized with various topics such as: Using English for Success, Essay Writing, and Personal Statements. 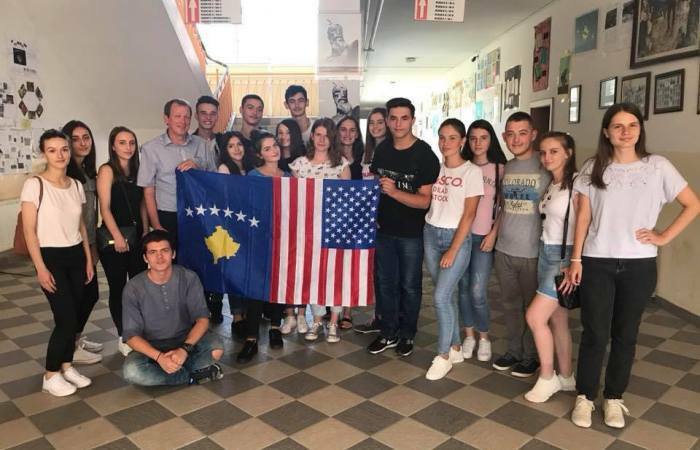 Knowledgeable speakers from around Kosove have taught high school students in Podujeve about these topics by incorporating technology in the classroom through the usage of projectors. On the very first session, we wanted to start on a positive and motivational note hence our topic was Using English for Success. During this session, different speakers from multiple parts of Kosove shared their experiences on how English has helped them throughout their lives and careers. More importantly, they also shared how the incorporation of soft skills, a part which we pay much attention to in PAWS, has helped them succeed in their lives. Growing up in Podujeve, I and my project partners always saw a need for extra-curricular activities in our town, especially when it came to academics. We all shared the experience of going to school, and then going straight back home as there was a lack of any activity which would keep us busy, but also help us grow academically at the same time. This is why, we decided that organizing PAWS is a good idea, so that new high school students from around Podujeve will be better informed on the various aforementioned topics and have a skill set which will serve them well when they embark on their new journey in university and later on in life. We are very thankful to have had IPKO Foudnation’s help to continue building on our dream to help Podujeva’s youth gain professional and academic skills as we have seen many students benefiting from it greatly last year. Our team strongly encourages everyone who wants to positively impact their communities by incorporating technology in any form possible, to look into the option of applying for a grant as it can really impact many lives for the better.